Welcome to Just Door Toolz. We have the RIGHT toolz 2-Use to MOVE, INSTALL, ADJUST and MAINTAIN Commercial Doors and Hardware. Our tools are designed specifically for commercial wood and metal doors. It is our intent to help save you time and money on your installation and maintenance of these doors. These tools are light-weight, easy to carry and easy to use. We have Door Dollies, Door Holders, Door Bars, Frame Setting Toolz, Vix Bits, Planers and Mortisers , Specialty screws and bits and more. For PHONE ORDERS CALL (954) 448-6872 . Major Credit Cards Accepted . If you prefer to purchase items online in our store then at checkout SELECT PAYPAL as the payment method. Paypal accepts ALL Major Credit cards too !! Since you're here in our store, we invite you to browse and shop with confidence. Take your time and enjoy viewing these special tools. Your shopping cart will be active until you leave this store. 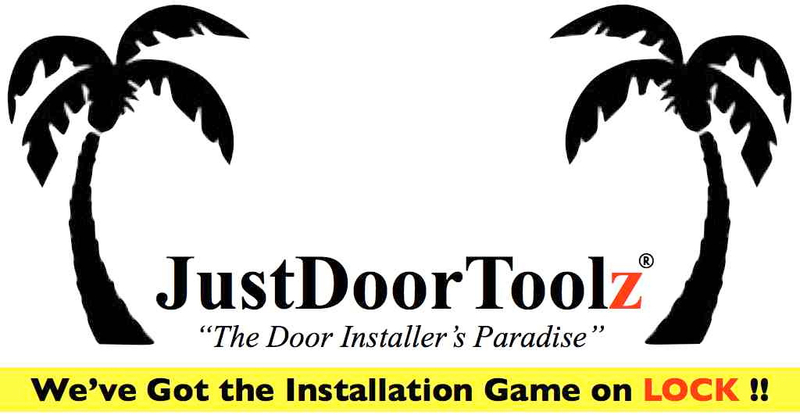 Thank you for your interest in these innovative door and hardware installation tools. Simply click on the picture or category heading to see the tools that are in that category. Check out "Ins & Outs" the Commercial Door and Hardware Installation Business Reference Manual. It's VALUABLE knowledge to have whether you're already in business for yourself or considering starting your own installation business. "Ins & Outs" are "Keys to Operating a Successful Commercial Door and Hardware installation Business." There's definitely more to the business of installing commercial doors and hardware than just installing doors and hardware. Thank you and Happy Hangin' and Swangin' ! Combos created to save you BIG Bucks! Door Movers, Holders and Lifters. WE CAN HELP YOU MANAGE THE LOAD. HERE ARE THE FRAME SETTING TOOLS DESIGNED TO SET THEM STRAIGHT THE FIRST TIME. SAVE LABOR , INCREASE EFFICIENCY AND REDUCE CALLBACKS FOR FRAMES SET INCORRECTLY. Innovative Hardware Installation Toolz to help YOU get More Productivity with LESS effort ! Go FROM Slab Door to Mortised Door with these TOP QUALITY TOOLZ. Need Hardware Parts & Pieces ? Look here. We might have what you need to finish the job. Closer Covers, Screws, Panic Device Parts, Hinges, Silencers, Bolts, Lock Parts, etc..
Tools to adjust doors to meet NFPA 80 and ADA requirements. Use these Permanent Templates for fast & accurate layout when field drilling holes for locks, panic devices and closers. Ready Shims for commercial doors. Finally here's a PERFECT system for shimming commercial doors !!! DIMPLE FRAMES ON THE JOBSITE IN NO TIME !! Here are your #1, #2 & #3 Philllip Insert Bits . We also have Taps and Bits for closers, panics and removable mullions and a Frame Dimpler. THE ONE DOOR BAR DOOR LIFTING BAR.. IT HAS A MULTITUDE OF USES !! They're ON SALE !! That's right......This is (20) 1" #3 Philllips insert bit and (1) Stainless Steel Holder. MADE IN THE USA ! WOW !! Trash the paper and make it PERMANENT. Layout Closer and Locks in a SNAP !! GET #1 #2 OR #3 PHILLIPS INSERT BITS AND TIPS. 1-INCH , 2-INCH OR 3-INCH LENGTHS AVAILABLE !! THEY ARE VERY GOOD TIPS THAT WILL HUG THE SCREW NICE AND TIGHT ! !